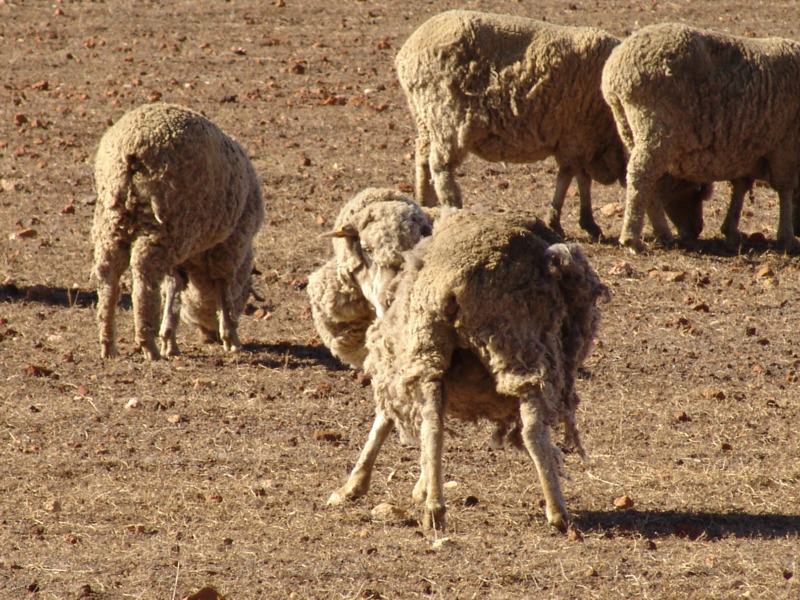 When the prevalence of sheep lice is high as it is in Western Australia at the present time, there is a greater probability that lice will be present in any flock. Once lice are found it is important to have a plan for lice eradication and to give the plan priority and due consideration within the farm management framework. If farmers have observed rubbing, examined fleece partings and found lice, then all of the flock will require treatment. The treatment plan needs to address several areas in order to successfully eradicate lice. Shearing removes 50-70% of lice with the fleece and when followed with a correctly applied chemical treatment, is an opportunity for eradication. Treatment in short wool requires an effective chemical and an appropriate treatment method for the particular situation. Read the product label to ensure that it is suitable for all of the stock classes requiring treatment (for example lambing ewes, suitable withholding periods). A clean muster, clean shearing and correct chemical application must be carried out. Shearing must occur as one event rather than split events, as current chemicals do not offer adequately long protection periods to accommodate split treatments. Lambing ewes should be treated at least six weeks prior to lambing. When applying treatments to ewes with lambs, it is necessary to strictly follow label directions, as a particular product may not be suitable for ewes with lambs, or ewes close to lambing, or have different requirements in relation to age of lambs that can be treated. Treatment directions will vary according to the age of the lamb (reflecting wool length). Weaned lamb flocks once shorn can receive a flock treatment as part of a whole farm lice eradication program. Once identified, cull sheep of any class should be removed from the farm, or chemically treated with the rest of the flock if there is to be any delay in their removal from the farm. Without treatment, cull flocks are a re-infestation risk to treated stock. Ensure secure fences between properties are adequately sheep-proof. Reach an understanding with neighbours of the actions which will be taken when animals have breached boundary fencing. Treat brought-in stock (including rams) as infested — low levels of lice are hard to detect in short wool and an infestation can be missed. Discuss previously applied treatments with the vendor and use the shear, treat and quarantine policy for all brought-in stock. Long wool treatments are used to reduce a population of lice rather than kill every louse (as in eradication) and are used to limit damage to fleeces until a whole flock shearing is conducted. Depending on the time to shearing, one or two long wool treatments may be required.